This is a graphic-intensive page takes which takes a long time to load on your screen. If a picture does not appear, right click it and select "Show Picture" or "View Graphic." This photo appeared in a pamphlet published in 1942 advertising Peerless Coal & Coke Company. The pamphlet inlcuded photos of company housing, the Peerless Mines, the company store and Vivian Grade School. Cooney Hendricks, who has lived in Vivian, WV all his life, made a copy of this photo for Elizabeth Burton Drees (WHS '53) from his copy of the pamphlet, which as far as we know is the only copy available today. Cooney has a reputation of being a walking encyclopedia on folks who lived in the Peerless area. The teacher is Miss Reyburn. 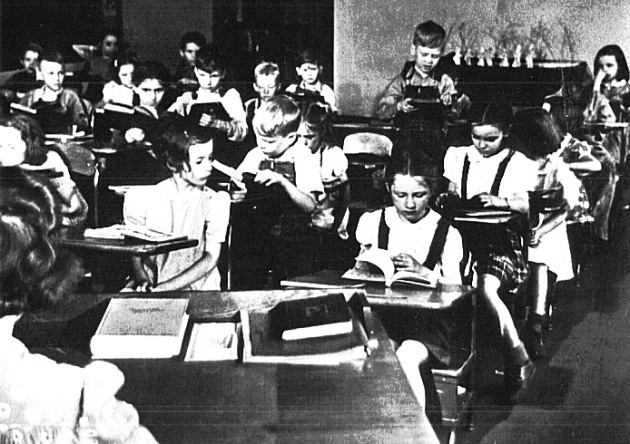 The girl in center front is Donna Wilson (WHS '53), behind her and to the left is Anna Fortuna (WHS '52), on the extreme right is Wanda (Rennie) Bratton (WHS '52), behind her is Elizabeth Burton and the young man standing and reading is Jimmy Lawless. From top row, left to right: Mrs. Jackson, Miss Sinicrope, Curtis Burks, Eloise Workman, Sam Mitry, ? ?, Ed Mosko, Nancy Williams, Johnny Anderson, Verna Mae Huff, Charles Bearden, Shirley Willard, Melvin Lane, Joann Willard, Ed York, Betty Snow, Gene Chapman, Wilma Jean Wilson, ? ?, Ed Rolosky, Patty Grass, Jim Lawless, Kathryn Kemp, Bobby Doss, ? ?, Bobby Schwartz, ? ?, Victor Larese, ? ?, Shirley Dehart, Dean Jones, Elizabeth Burton, Bill Lackey, Shirley Williams, Jack Fields, Blanche Hamden, Frank Camden, ? ?, Donna Wilson, Ray Gunter, Marylou Cooper, Jimmy Kalaski, ?? Ed Larese, ? ?, Geraldine Lawson. Please contact Elizabeth if you have any information on the persons not identified in the above photos.